Twitter action has been fast and furious with this morning’s news of the first clear dip in light from Boyajian’s Star (KIC 8462852) since the Kepler data. I’m on the road most of today and so couldn’t get off a full post, but I did want to pass along Tabetha Boyajian’s newsletter, short but sweet. Not much time to share details – we are working hard coordinating followup observations. Here is a snapshot of LCO data for the Month of May. Stay tuned! And here is Jason Wright’s video chat on this event during his visit to UC Berkeley. And while all our telescopes are on that the aliens slip in from behind us. A clever plot indeed. Great another sleepless night thinking! Will it be a little dip first then a larger dip followed by a smaller dip. Might have to refill the coffee tin again or even better get a bigger one! Why is still called Boyajian’s Star ? At least the link calls it the WTF star, certainly better. I completely agree. I think of it as Hunters Star. I think that naming after a Tabby is completely apropos for a star located inside a Swan; this is an example of cosmic humour! We should show em we know how to laugh! Also, what can you say otherwise of someone who singlehandedly has redefined acronym WTF! Flux you I say, Tabby it must stay!…also, it’s tres poetical. I also believe that 1400 l.y. would be no problemo for any self-respecting advanced entities – perhaps (or likely) not at the “macro-scale transit problems” we focus on with our (perhaps unique) tech evolution, but at the “tiny vibrations inside other tiny vibrations” scale – who knows! Dr. Boyajian herself has been very conscientious about sharing credit where it’s due. But she’s easily KIC 8462852’s principal investigator. I think it would be unseemly for her not to receive the normal conventions and courtesies. Thankfully, the scientific community keeps much better track of contributors now than in generations past, even when popular awareness falls short. History will recognize the Planet Hunters’ landmark observations. Still, at my last count, in addition to her own contributions Dr. Boyajian had organized professional expertise and labor from more than fifty others, and marshaled an unprecedented worldwide posse of individual donors. Kind of like the Buckaroo Banzai of IRL astronomy. Thanks for the link, I was not aware of her prediction. And then there is the mystery of the long-term dimming. Fascinating. This system is too far for the heat signature is it not? I think it was the Russians that snuck in …dont give the aliens ideas ….. It would be useful to get infrared time series photometry at the longest wavelengths to try to understand if this is short-lived clumps of dust being produced by something. Its very odd how there is no detectible IR excess. I’m going to buck the trend by suggesting the bright periods are nuclear flare up periods and the dip is a drop back to normality. This means the overall dipping over centuries if not longer is the overall loss of fuel and the cycle is a build up cycle of residue hydrogen? I am wondering if it will have the period of ~24 days indicating an object in orbit. Wow… this just keeps getting better and better! What’s the latest? What has happened to the dip since the 16th? Scavenging some social media doesn’t turn up much, so I suppose that’s bad news. No kidding. An eager relief to be preoccupied with breaking news from above, for a change. Okay, I read the X axis labeling as the 16th of May. But 16 is a “Geocentric Julian” date number. Looking forward to how this will go down. We are like an ant colony in the middle of a construction site but do not quite realize it. And how often do construction workers pay attention to the ants? I hope we stay out of the coffee and food figuratively speaking. It’s better not to make a nuisance of ourselves and to be ignored. Probably too late for that, as we have a bubble of electromagnetic radiation extending around Earth about 200 light years across. A puny amount compared to being in a galaxy of 400 billion star systems 100,000 light years across, but this and anyone doing a spectral analysis of Earth will be aware that something potentially interesting is going on here. It may be worse for us if advanced ETI rebuilding the galaxy are unaware of humanity due to our young, primitive status, or just do not care even if they do know we exist because we are so different. They may spray some Raid on those ‘ants’ without a second thought. Or just turn our Sol system into another Dyson Shell and not even bother to spray first. Some members of our species still kill whales and dolphins despite their obvious high intelligence. The “problem” is that they look and act like fish and not primates. Which is probably not easily detectable beyond the Oort cloud in the order of 1 light year radius. A hundred times as far, and the emissions are 10,000 times fainter. And certainly not detectable at Tabby’s star for more than another millennium(about 1300 LY away) even if they have extraordinary detection ability. We can see what they were doing over a millennium ago. If they are looking at the Solar System right now, over a millennium after building a megastructure(if that is what we are seeing), they are currently looking at Earth during the Dark Ages, no artificial emissions at all. Unless the Galaxy is literally teeming with technological civilizations, with some very close, it’s easier for us to see their megastructures being built in the past, long before they’ll see our radio emissions in the future:). And before long, our transmissions(except deliberate METI) may be so tightly focused and efficient that they are all but undetectable. As a counterbalance to this, there was a review of the stellar data by Sheikh et al last December that suggested a potential intrinsic stellar variability cause suggested by unstable magnetic field periodicity , likely arising in the thin outer convective envelope typical of an F3 star. KIC 8462852 and stars of similar mass also sit on a bit of the main sequence where a recognised “instability strip ” ,consisting of many variable stars , transects it. To date there are no known stars with a periodicity consistent with “Tabby’s star ” , but work on numerous similar mass Kepler field stars has found examples of one type , fast rotating Ap stars ,” roAps ” . These have variability indeed driven by magnetic field instabilities suggested by the Sheikh study . (KIC8462852 has a 0.88 day rotation period. ) One such star was found to oscillate over sixty days, described in 2015 by Cunha et al , a group of asteroseismologists with a interest in this area . Over the last twenty years or so the periodicity of examples of roAps has progressively increased as more have been discovered , from a few minutes in earlier cases right up to this extended period . Further incremental increases may yet approach the much longer oscillation frequency of KIC8462852. The intrinsic picture fits the observations at least as well as any external occultation event , though it doesn’t fit with Schaeffer et al’s findings of a progressive dimming over the last century. Clearly a lot of detailed spectroscopy and asteroseismology needs to be done on KIC 8462852 to better constrain its physical and chemical nature . Initially from the ground via the worldwide Las Cumbres telescope network as planned , and eventually via extended PLATO observation most likely – before stellar variability can be excluded as an explanation . Or not. Dirk Bontes predicted this(and posted many comments about it on this website)WAY BEFORE Sheikh et al did. He even wrote a thousand word “essay” on it and posted it on the internet. The only ADDITIONAL FEATURE in the Sheikh paper was the use of “avalanch statistics”. Mr Bontes has been strangely silent since then. I would like to see his comment on “avalanche statistics” and hope he posts another comment here soon. Be interesting to hear what he thinks. Avalanche statistics as I understand it simply predict trends , which in the case of the KIC8462852 observational data suggest a picture consistent with unstable phase magnetic field periodicity. This COULD be consistent with some form of intrinsic variability but doesn’t suggest any mechanism . Simply a trend. There has been a lot of work done looking at variability ( as part of detailed ongoing asteroseismological studies ) in Kepler fields stars , with at least one type, roAps , discovered to exist in the cohort and showing increasingly long periodicity trends as more are discovered , building towards ( but still somewhat short ) that of KIC8462852 . Early days but offering a potential mechanism , as roAp variability has indeed been shown to be related to changes in magnetic field phases consistent with the Sheikh work. I’m no stellar physicist but I understand it’s to do with the chemical make and structure of stars of a certain mass , occupying an “instability strip” that crosses the main sequence at or around that occupied by low F spectral class dwarfs. Like KIC 8462852 and atleast one other Kepler field star identified as a roAp and with the longest known period yet , of sixty days . Discovered in 2015. The stellar characteristics arise from unpredictable magnetic fields arising in the thin outer convective zone of such stars giving which are further compounded by persistent rapid rotation due to lack of the “magnetic breaking” seen as stars usually age . KIC8462852 rotates in less than a day. Most stars at this point are indeed stable , but a disproportionate number of variables ( including the better known delta scuti type ) occur on, below and also above the main sequence at this point. All of this is falsifiable with further observation and spectroscopy , so over time can be confirmed or excluded. Interesting comment, but KIC8462852 is NOT a roAp star because it does NOT contain any of those heavy elements in its spectra, unless, of course, they have all been STARLIFTED out. HMMMMMMMMM!!!!!! Comparison of a spectrum taken on May 20 and last July shows no difference, except what’s expected from Earth’s atmosphere. The wavelength range was 5800 – 9400 Angstroms. The implication is that the dimming isn’t consistent with a gas or dust cloud causation. It is consistent with a ‘solid’ occulter and might be consistent with stellar variability. More spectral bands will need to be studied of course. Many thanks Adam. Very helpful . My very local “Astrophysics ” University too ironically . I know Chris Copperwheat, so will get in touch and ascertain their thoughts in detail along with what plans they have. I just read this on http://www.reddit.com/r/KIC8462852. “…Dr Boyajian has ruled out stellar variation…”. This being a comment from someone OTHER than Dr. Boyajian HERSELF, I am taking the validity of this comment with a grain of salt FOR NOW. I hope she posts something on this subject HERSELF soon! I believe there was a 2.6 sigma spectrum detection around 850 micron which is near an emission line for CO. A smallish planet may be boiling off and CO is one of the molecules been driven off, I feel moons may be altering the shape of the material be evaporated off. Also, if only large pebble- and stone-sized particles are present with total emitting area comparable to the star surface area, there will be dips in Kepler lightcurve, but no prominent IR excess… Waiting for the results! which implies a solid object and hence supports the ETI Hypothesis. It certainly is becoming a real enigma. When pulsars were first discovered they were referred to half jokingly as LMGs. Little Green Men. Because the precise pattern of the radio pulses generated at the time appeared to be artificial and not natural. the observed characteristics then we have a great mystery. Would that mystery indicate more strongly the gaps in our astronomical knowledge or the possibility of an ETI artifact or ETI activity? If you are a species that can take apart an entire solar system to build an actual Dyson Shell, you may not worry much about threats from any neighbors. If the evolution of biological intelligence follows a similar pattern on a cosmic scale as we have seen on Earth, then perhaps the real reason – or at least the initial one – a species would construct a Dyson Shell is as a weapon. Perhaps as a deterrent to any hostile neighbors, but possibly also as a way to preemptively get rid of potential threats or remove any future competition for galactic resources, or maybe both. I know we want to think (and hope) that really advanced aliens are benevolent and godlike, who would never consider harming even the least among them, but once again we forget they would be aliens with alien mindsets. No doubt bacteria, if they could, would consider humans to be terrible and powerful creatures who are constantly trying to wipe them out for unfathomable reasons. My remark actually were a intended as a lighthearted joke on those who tend to see extraterrestrial activity in unexplained phenomena. This case isn’t the only example, the fast radio bursts is another recent example. As for KIC 8462852 I had started to think the dimming were in the star itself and then this paper came up with an explanation how it might work. I have been combing the internet looking for new info. I found this Q&A with Tabetha Boyajian today. Typical the lightcurves of the just dimming of Tabbies star shows a going down of the brightness and then in the night to Sunday (in Europe) a not less important(?) increase; in the phantastic hypothetic choice could it be the case that the alien structure is opened in a wise to let light through to us after a dim. From one harry to another; welcome to this website. What you describe has a name. it is called a Star Shutter, and has previously appeared on this website. Wow. Thanks. That was terrific. The overplot of historic Kepler data was shocking. Whatever this thing is, it looks solidly periodic. Non-uniform. IR non-emittive. (At least prior to all this hubbub, the minds were not equivocal: an engineered object should still emit IR.) Elliptical orbit improbable. Intrinsic stellar variations unlikely. Behold, Boyajian’s Star. Destroyer of hypotheses. Something to keep in mind: Kepler was looking at a very narrow range of sky to take a statistical sample of the number of exoplanets in the Milky Way galaxy. In that small slice of sky it found Tabby’s Star. What does this tell us? Either that we just got very lucky to find such a rare cosmic body, or that objects like TS are relatively common. If the latter and if they are artificial, let that one sink in. It isn’t that difficult to list signals and objects we theoretically considered artificial in nature. They have some common traits like high energy requirements, isolated occurrence and location. If indeed they would be artificial it would indicate that intelligent life is indeed very rare, most likely interstellar travel is tremendously difficult, civilizations don’t feel need to colonize extensively and are possibly post-biological mechanical intelligences. And most likely are indifferent to a early primitive civilization such as ours at this stage. I also hope it’s an alien spaceport of gigantasaurus size, with heavy traffic coming and going. Why would someone build a giant spaceport around a young star with a relatively short life so far as stars go? Are we also assuming all these docking spacecraft can also go FTL? If so why need a spaceport, and why in a solar system that probably doesn’t even have any useful worlds? Besides, they’re probably being turned into that “spaceport” as it is. I think a billion or two years is probably long enough to amortize the investments. Why? Well, because it makes a good observation platform for astronomers, doesn’t it? What if the spaceport includes a university of some kind? Or maybe it’s just a general meeting place, and because there aren’t any planets (that we know of right now) in orbit, using a warp drive to come and go won’t do any harm to any neighboring planets. It might also be a good place to have a depot for a military/industrial complex, and a place where a solar furnace could be employed in building interstellar transportation, without interfering with a settled planetary system. You just have to have an imagination to see the possibilities. The possibilities are endless. Why would a young star system full of debris be a good place for an astronomical observatory? What makes Tabby’s Star’s position in the galaxy better than any other spot for astronomy? Same goes for a spaceport. If anything most of these suggestions show a lack of human imagination, but hey, we are young and quite limited when it comes to cosmic experiences. Plus Star Trek and Star Wars have certainly taken their toll. Less than a century ago most people still thought the Milky Way galaxy was the entire Universe, if that gives you any idea how far humans have to go. There are plenty of star systems with much more stable and longer lasting suns that advanced beings could utilize. They are called red dwarfs and they make up most of the Milky Way. Plus these systems are likely either uninhabited or only possess native life forms that could do nothing about entities that can build Dyson Shells. And some pulsar planets(like PSR 1257+12b and PSR 1257+12c)may host life on their SURFACES: https://arxiv.org/abs/1705.07688. A very appropriate comment. After reading the PDF, i GUESS(correct me if I am wrong) this scenario works ONLY if PSR 1257+12 were a RESULT of a Neutron Star-White Dwarf MERGER! Therefore, the inhabitants of PSR 1257+12b and PSR 1257+12c would have to be Cheela-LIKE due to the PRESUMED COMPLETE ABSENCE OF WATER! Still worth a DEDICATED ATA and GREEN BANK observation run, though! Breakthrough-Listen, ARE YOU READING THIS!!! Let’s see if it dims in 24 days time. IT JUST DID!!!!!! After MANY MANY days of speculation, Tabitha Boyajian has FINALLY posted on Twitter that the June 11th “event” is indeed real and is currently at 2%! ALSO: EricSECT posted a VERY INTERESTING QUESTION on the KIC8462852 sub-reddit, asking whether the “rumor” that Boyajian’s Star has had its spectral type RECLASSIFIED from F3 to F2. If this IS true, then it is WEIRD ON STEROIDS!!!!! If the star has been FADING over the last 8 years(2009-2013 PROVEN by Kepler, and 2014-present HIGHLY LIKELY based on AAVSO data) any reclassification should go IN THE OPPOSITE DIRECTION(F3 to F4)! I would appreciate a response from him ON THIS WEBSITE to see what he found out! According to Tabitha Boyajian, “dip 2” has now ended. As others have proposed in detail, there is no doubt that whatever is causing Boyaijan’s Star to dim, it’s something unusual. The likelihood of it being planetary debris, or cometary material is still unconvincing, and most likely doesn’t account for the dimmest dips on record. There is one thing that could absorb radiation coming from Boyajian’s star, and that’s a black hole. But of course, a black hole sitting between us and the star doesn’t explain the apparent unpredictability of the dips (at least unpredictable given the data we have available), and a heated up debris disc around a black hole would still have radiation to present. I’m thinking there is another possibility, and that is a seemingly chaotic double or trinary black hole, deflecting radiation as the black holes pass between us and the star. The distance between us and the black holes must be such that the occulting disc is enough to account for a 22% dip in Boyajian’s Star radiation, and close enough to the star that the gravitational waves are strong enough to deflect radiation. Radiation won’t appear to be deflected linearly as the black holes are rotating. Taken in isolation, black holes trace patterns of gravitational waves not unlike the arms of a spiral galaxy. When several such waves overlap, their combined patterns look random on a 2d chart, but the effect of pseudo-randomly resonant gravitational waves could be massive, deflecting a part of the Star’s radiation in all directions, and absorbing a fair amount of it as well. The complexity of detection of the black holes may be made harder to tackle depending on the structure of the system, if it’s in fact a trinary or multiple black system of some sort. Unusual shifts in the star light should be present in registered spectra near the moment the star begins to be obscured, and near the time occultation ends. Strange? Yes, super weird. But still, less weird than alien intervention. The good news is that this should be observable when the data becomes available. ALSO: If a Black Hole were in between us and KIC8462852 at a distance of GREATER THAN 550 AU from EITHER us OR KIC8462852, it would MICROLENS the star, making it appear MANY TIMES BRIGHTER than it actually is! Since ANY Black Hole less than 550 AU from us has been DEFINITIVELY RULED OUT, that would leave a BH less than 550AU from KIC8462852 as the only possible way to do it. HOWEVER: There are TWO THINGS that make this scenario VERY UNLIKELY! To get MULTIPLE DIPS , the Black Hole would have to be passing in front of KIC8462852 MORE THAN ONCE. THIS IMPLIES A PERIODIC ORBIT. The two things making a periodic orbit HIGHLY UNLIKELY are as follows: ONE: Such an orbit should have been detected by radial velocity ALREADY. TWO: An orbital period of roughly two years would mean that the Black Hole would be accreating gas from KIC8462852. This gas should be MUCH HOTTER THAN THE STAR’s surface snd should have showed up in the UV, which it hasn’t. Periodicity is could be extremely hard to detect in a multiple black hole system. So far, it’s the least unlikely of the possible mechanisms I have been able to consider. Again, far more likely than alien engineering. Wouldn’t we need to know how many advanced alien civilizations exist Before we can say how ‘likely’ alien engineering is? A black hole that big would have a mass of about a hundred thousand suns. I don’t see strong commitment to either a circular or elliptical orbit by the astronomers (as of Sunday). But the evidence for a circumsolar origin seems considerably strengthened. We’re going to need a lot more data to be able to tease out true periodicities and comparisons across different cycles. This is going to take years, folks. My pet theory is that of a circumsolar body that has been drastically fragmented by a massive collision event. One paper proposes a huge planet with a giant ring system and surrounded by Trojan planetoids on either side in its orbit. Maybe, but why is there such a growing whiff of epicycles in the air with each new explanation for Tabby’s Star? Remember when it was giant swarms of comets? The relief that a superior intelligence occupies the same galaxy as we do was not involved was palpable then too. Even if Tabby’s Star turns out to have a natural explanation, that will not reduce the general fear most humans have about ETI. Not only is it a fear from a general public indoctrinated with decades of marauding alien invaders from bad science fiction, but also the professionals who cringe from both the decades of UFO cultists as well as the bad SF aliens. And oh yes, the centuries of being told we are the special ones living on a privileged planet, an idea that has not gone away despite knowing that we are a very small part of a very big and ancient Universe. I cannot read the mind of the author of that piece, but my view about this is very different. Discovering aliens, or alien artifacts would be a momentous discovery. Possibly the greatest in history. If so, you want to be really, really, really sure of your evidence, because we have a history of making claims that are proved wrong in this regard. Another Senator Proxmire would gut any further funding for research that had even a hint of looking for life and aliens in the universe. I don’t think we are there yet. I’m not sure we are even close to that point yet. The star KIC 8462852 is also known as Tabby’s Star, or the WTF star for “Where’s the Flux?”. 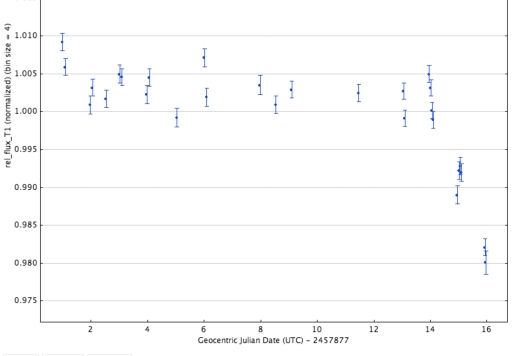 Paul Gilster: I have mentioned TWO THINGS REPETEDLY in comments with respect to posts regarding Boyajian’s Star: ONE; successfully MODEL the “Q8″(day 792)light curve and MOST of the “natural” hypotheses will be ELIMINATED! And TWO; look for POTENTIAL messages in the data that are NOT a PRODUCT of normally occurring NUMEROLOGIES! A NEW paper titled “KIC8562852-Physical Modeling of its Occulting Objects and the Mystery of the Cyclic Fluctuations”. by Andrew Collins, Rodney Hale, seems, to me to have done JUST THAT!!! Please log onto http://www.viXra. org ASAP and read the PDF! If it interests you ENOUGH, please contact them and ask them to do a guest post. Before I get TOO HYPED about this, I need to have some questions answered. FIRST, why did they CHOOSE to put their pre-print onviXra INSTEAD of the MORE WELL KNOWN arXiv(in fact, ontil today, I was unaware that http://www.viXra.org EVEN EXISTED)? SECOND(AND MOST IMPORTANT)will OTHER “light curve” SPECIALISTS confirm their findings? The only OTHER ‘light curve” specialists I know of are Ellin Bodman and Anne Quillan, authors of a paper on Boyajian’s Star, and(separately)Jose Solorzano, a computer graphics designer who has posted MANY BLOGS regarding the light curves of Boyajian’s Star on the Science 2.o website and is also a regular contributor on http://www.reddit.com/r/KIC8462852, the sub-reddti dedicated to Boyajian’s Star. Is there a planet or a second sun in that data? Its spiking 12 days apart at day 3 and 15. The way it drops off from that spike I’d say it has a 3 day cycle of something a portion of the mass of that twelve day cycle. Jason Wright recently stated in an interview for Discover Magazine that Boyajian’s Star is the most mysterious star in the universe and that Przybylski’s Star is the SECOND most mysterious. These two stars MAY now have some NEW COMPETITION! Enter PSR B1828-11, which BOTH ‘glitches” AND “wobbles”!!! The theories “explanong” glitches and wobbles CONTRADICT EACH OTHER, meaning that pulsars SHOULD NOT BE ABLE TO DO BOTH AT THE SAME TIME!!! The BIG question is: Could there be a NON-NATURAL SOLUTION to this problem? In the light of a RECENT paper dealing with the ability to detect Dyson Spheres around pulsars, could such a hypothetical Dyson Sphere be the CAUSE of this apparently irreconsilable data set? Humanity could be surrounded by ETI astroengineering projects, yet most of current humanity would have as much of a clue about them as an ant colony at a construction site. Just like the situation with the dinosaurs 65 million years ago: Unlike them (we think) we at least know about cosmic impactors that can hit Earth, but we have yet to really do anything about them. The same with SETI/METI: Mostly sporadic, token efforts in a few bandwidths. As the last few major events have shown, the professionals are still incomplete at coordinating observations and much too quick to dismiss signals as coming from unnamed satellites. Meanwhile the press and what passes for journalism these days just parrots what they are told by the so-called experts, only clouding the issue. Aliens could be in our Sol system rearranging the comet and planetoid belts, and we wouldn’t know it, or assume it is a natural phenomenon. The transits appear to originate from the habitable zone? Observations of the main sequence F3 V star KIC 8462852 (also known as Boyajian’s star) revealed extreme aperiodic dips in flux up to 20% during the four years of the Kepler mission. Smaller dips (< 2%) were also observed with ground-based telescopes between May and September 2017. We investigated possible correlation between recent dips and the major dips in the last 100 days of the Kepler mission. We compared Kepler light curve data, 2017 data from two observatories (TFN, OGG) which are part of the Las Cumbres Observatory (LCO) network and Sternberg observatory archival data, and determined that observations are consistent with a 1,572-day (4.31 year) periodicity of a transit (or group of transits) orbiting Boyajian's star within the habitable zone. It is unknown if transits that have produced other major dips as observed during the Kepler mission (e.g. D792) share the same orbital period. Nevertheless, the proposed periodicity is a step forward in guiding future observation efforts. Detection of a repeated transit signature in the light curve of the enigma star KIC 8462852: a 928-day period? KIC 8462852: Will the Trojans return in 2021? They are blaming the dips on dust. What happened to the ever popular swarm of comets and then the giant ring system from the massive planet? Where is all the dust coming from and why does it keep fluctuating so much? Funny how just a few months ago the experts and media were practically crowing that Tabby’s Star was “just” a fleet of giant comets and not advanced aliens doing something on a massive scale around that sun. Now they admit all the new evidence is making conventional explanations rather difficult to match up with the evidence. Yes, it may be dust, but dust produced from what and why so fluxuaty? No, it may still not be due to aliens, but the more we learn the stranger things get. Fascinating, as that famous fictional ETI from television might say. I want to add that in that first linked news article, JPL says the dust indicates it cannot be an “alien megastructure.” Do they really know what one would actually look and behave like? Would any of us crawling about on the third rock from Sol? At least they didn’t use that worn out old artwork of those really dusty comets looking like they are about to barrel into the star.